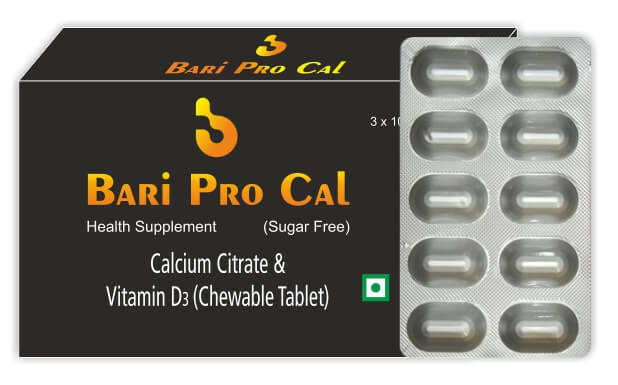 Calcium Citrate with Vitamin D3 Tablet is one of the most convenient forms of supplementing diet with the essential nutrients like Calcium – which provides nutritive support for healthy bones and teeth in combination with vitamin D3 – to help maximize calcium absorption. Calcium Citrate with vitamin D3 Chewable tablet is designed to meet the calcium replacement needs of consumers. This can be chewed or allowed to dissolve in the mouth and are designed to be easy on the digestive system, to support maximum absorption and to foster compliance. People who have weak and brittle bones, and are prone to frequent fractures may consume these supplements. Also, people who do not consume enough calcium in their diet due to their busy lifestyle should go for these supplements to fulfill the nutritional gap in their diet. The level of calcium in the blood tends to deplete as we age, especially in the case of women. The majority of calcium is present in the bones and teeth. This mineral also forms a major part of the muscles, blood and other tissues. Therefore, it is important that you start focusing on supplemental calcium at the right age, Women start losing calcium from their body after the age of 25. Therefore they are more prone to calcium-related bone disorders, like arthritis and osteoporosis. So it is very important to stay updated about your calcium intake. Today's hectic lifestyle leaves no time to keep a check on whether you are consuming balanced meals or not. For this reason, calcium supplements, especially calcium with vitamin D3 combination are very helpful for fulfilling the calcium and vitamin D3 requirement. These supplements are also consumed for bone-related problems in the body like osteoporosis and arthritis. Osteoarthritis and Oesteopenia, two of the major health concerns, are among the leading cause of pain and disability. Osteoporosis and low bone mass are currently estimated to be a major public health threat. The most recent definition of osteoporosis is a disease characterized by loss of bone mass, accompanied by micro architectural deterioration of bone tissue, which leads to an unacceptable increase in the risk of skeletal failure; the micronutrients of greatest importance are calcium and vitamin D. Calcium has been shown to have beneficial effects on bone mass at all ages, although the results are not always consistent. Throughout the life cycle the skeleton requires optimum development and maintenance of its integrity to prevent fracture. Bones break because the loads placed on them exceed the ability of the bone to absorb the energy involved. (X) Added vitamin D3 assists calcium absorption to enhance benefits for bone health. Well absorbed Calcium Citrate with Vitamin D3 is formulated into orange flavoured chewable tablets and useful dietary supplement for those who wish to increase their intake of calcium with vitamin D3 for maintaining the function and structure of their bones. Calcium citrate is the calcium salt of citric acid. Calcium plays a very important role in the body. It is necessary for normal functioning of nerves, cells, muscles and bones. If there is not enough calcium in the blood, then the body will take calcium from bones, thereby weakening bones. Having the right amount of calcium is important for building and keeping strong bones. Calcium (Ca) accounts for 1 to 2% of adult human body weight and is one of the major mineral components of the skeletal system. Small but essential quantities of calcium are required for nerve conductivity, muscle contraction, hormone and enzyme secretion, and blood clotting. Adequate Ca intake is essential for normal growth and development of the skeleton and teeth, and for adequate bone mineralization. If calcium levels in the blood drop below normal, calcium will be taken from bone and put into the blood in order to maintain blood calcium levels. Therefore, it is important to consume enough calcium to maintain adequate blood and bone calcium levels. Calcium is a primary mineral for building the strong structure of bones and teeth. The product is POSSIBLY SAFE for most adults when taken by mouth.There is no disadvantage associated with the product if taken under the recommended usage. The combination should only be used in pregnancy and lactation if benefits outweigh the risks. Pregnant and lactating mothers should not take any single supplement in higher-than-normal doses unless recommended by a health-care provider for a special condition. Stay on the safe side and avoid use.